From these words grew the legend that Galileo dropped simultaneously from the Leaning Tower of Pisa iron cannon balls of different weights, and that they hit the ground simultaneously. The story could well be true. Galileo, however, never claimed credit for any such demonstration while he was alive—an unlikely omission had he really carried out the purported experiment. Another legend has Galileo's study of pendulums stimulated by observing a hanging incense burner swinging back and forth in the Pisa Cathedral when he was a student, in 1583. Supposedly, Galileo noticed that each swing took the same time, whether the arc of the swing was large or small. This legend might also be true, although Galileo didn't develop his theory of pendulums until 1638, and the huge bronze incense burner in the central aisle now pointed to as Galileo's inspiration was installed after a fire severely damaged the interior of the cathedral in 1596.
in which he, Thomas, described the great orb of the heavens as "garnished with lights innumerable and reaching up in Sphaericall altitude without end" (Hetherington, Encyclopedia of Cosmology, 93-94, 176-77). 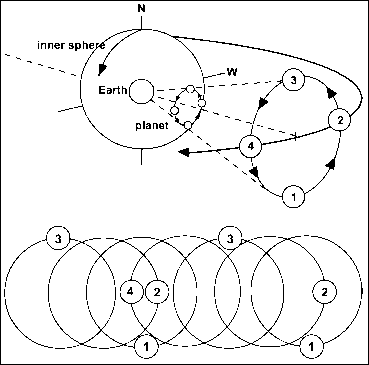 His diagram depicts stars scattered at varying distances beyond the former boundary of the sphere of the stars and notes that the stars extend infinitely upwards. The diagram also illustrates continued obliviousness to another logical consequence of the Copernican model: Thomas accorded to the Sun a unique place at the center of the universe, even though the concept of a center loses all meaning in an infinite universe. The idea of the Moon as a planet similar to the Earth would be dramatically emphasized by Galileo Galilei's telescopic discoveries beginning in 1610. He was born in 1564, the year of Shakespeare's birth and Michelangelo's death. His father wanted him to study medicine, which Galileo did at the University of Pisa. But he preferred mathematics and studied it with private tutors in Pisa and then at home in Florence. Soon he was giving private lessons and then was appointed to the mathematics chair at the University of Pisa when he was only 26 years old. Obstinate and argumentative, Galileo was unpopular with the other professors. His experiment involving cannon balls dropped from the Leaning Tower of Pisa—if it really occurred—was a public challenge to Aristotelian philosophers. In 1592 Galileo left Tuscany to take up the chair of mathematics at the University of Padua, in the Republic of Venice. He would stay there 18 years. In 1609 rumor reached Galileo from Holland of a device using pieces of curved glass to make distant objects on the Earth appear near. 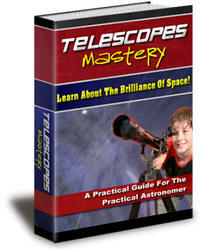 He quickly constructed his own telescope and turned it to the heavens. One of the first objects he viewed was the Moon. Large dark spots had been seen by many observers before Galileo, but his far more detailed telescopic observations more emphatically demanded the revolutionary conclusion that the Moon was not a smooth sphere, as Aristotelians had maintained, but was uneven and rough, like the Earth. Discernible features of the Moon—the so-called man in the moon—might be attributed by followers of Aristotle to vapors and mists terrestrial in origin or to lunar mountains and craters under a smooth, transparent covering material. But such ex post facto arguments were no match for Galileo's new telescopic observations. 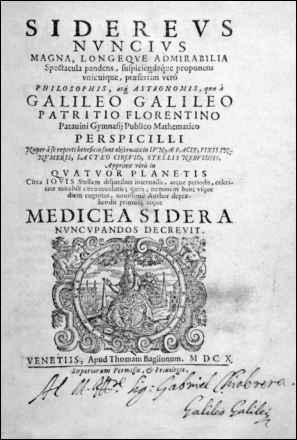 Figure 15.3: Frontispiece, Galileo Galilei, Sidereus nuncius, 1610. ASTRONOMICAL / MESSENGER / great and admirable sights / displayed to the gaze of everyone, but especially / PHILOSOPHERS and ASTRONOMERS, observed by / GALILEO GALILEO / Florentine patrician / University of Padua public mathematician / with a spyglass / devised by him, about the face of the Moon, countless fixed stars, / THE MILKY WAY, NEBULOUS STARS, / but especially / FOUR PLANETS / around the star JUPITER at unequal intervals, periods / with wonderful swiftness; by anyone / until this day unknown, / the author detected and decided / to name first / MEDICEAN STARS. toward the Sun, while the opposite side was bright, like a shining mountain peak. Near new moon, the portion of the Moon shadowed from direct sunlight was slightly brightened. Ruling out an inherent and natural light of the Moon or reflected light from Venus, Galileo argued that the source of light was sunlight reflected from the Earth: earthshine. Thus the Earth was not devoid of light, but was similar to bodies such as the Moon and Venus. Galileo's observations of satellites of Jupiter furnished another similarity between the Earth and a planet: both had moons circling them. Thus there was more than one center of motion, as the Copernican system asserted and the Ptolemaic system had denied. But much as Galileo wanted proof of the Copernican system, Tycho Brahe's planetary system (discussed in the following chapter), a compromise adopted by many influential Jesuit astronomers, also had more than one center of motion. Theories may be refuted by observation but not proved, because some other theory with the same observational consequences is always possible. Still, Galileo's observations strengthened the Copernican case.